Begin this project by discussing and showing photos of trees. Talk about the trunks of trees when its winter and how they look at different times of the day. Discuss how to draw and show examples on the board with students. Also have students come up and draw trees and branches to show class the different and many ways there is to do it. There is no wrong looking tree J then tell them to draw their tree lightly onto the watercolor paper with pencil. 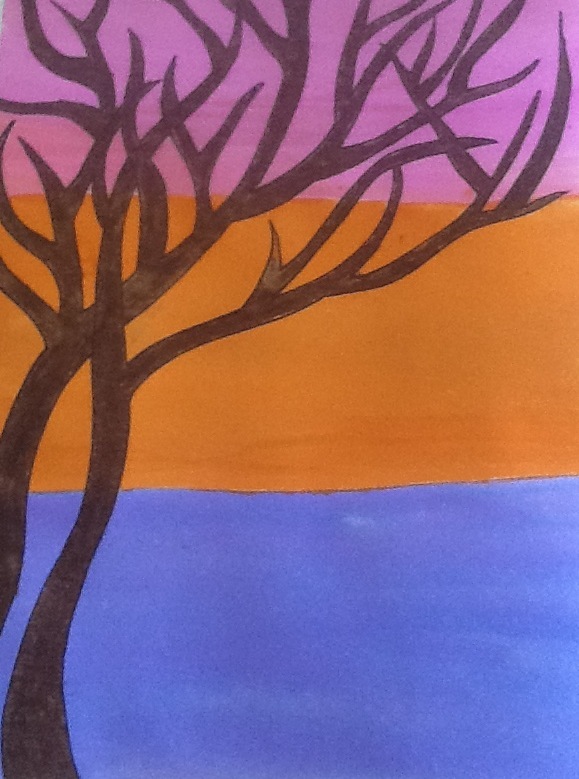 After this is completed they can trace the tree with a dark tone oil pastel. I did have some dark blue trees, which is fine. Then when they finish that have them decide on opposite colors to make the tree pop off the paper. The example has three watercolors but two will work fine too. Be sure to discuss waiting till watercolor dry before touching them together while painting. Always start light then move to darker tones. Wet on wet watercolor will run together. Once they are done with the watercolor have them sign and remove tape. You are done and the results are beautiful.